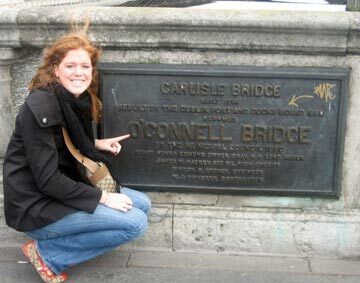 Wayne resident, St. Mary’s Presbyterian church member and Main Line college student Missy Pearson has agreed to take AroundMainLine.com abroad for not one, but two semesters! Missy has been doing a terrific job keeping us up to date on her tremendous travel adventures and we have had a great response and interest from our readers who are anxiously awaiting the next great experience! Pearson is a Loyola University (MD) junior and is participating in her university’s oldest study abroad program at Katholieke Universitat in Leuven, Belgium. Pearson and her classmates are experiencing the beautiful countries and cultures of Europe for this entire school year. We just heard from Missy the other day as she was recently back from an amazing trip to Morocco. We can hardly wait to see the pictures and here first hand Missy’s Moroccan experience. Thanks so much Missy for taking the time to share the experience of a lifetime with the entire AML family! Dank u wel! Cheers from the land of Guinness and U2! What an awesome, whirlwind weekend I had! I spent this past weekend in Dublin, Ireland sight-seeing and catching-up with two of my roommates from this past year at Loyola who are spending their junior year in Newcastle, England. After waking up at six in the morning, I caught a flight (by myself) to Dublin to meet up with Trish and Laurie Ann. Dublin is a great city for students. There are plenty of affordable hostels, enough tours and sites to fill a weekend trip, and a lively nightlife. My only complaint is the bars are much more expensive than I am used to. I guess I’ve become spoiled by the student prices I’m accustom to in Leuven. But, from the moment we arrived, we embraced Irish culture. We spent Friday afternoon at the Guinness Storehouse, which is totally worth the 11euro admission. The museum is very well done, its interactive and there is so much to see and learn. 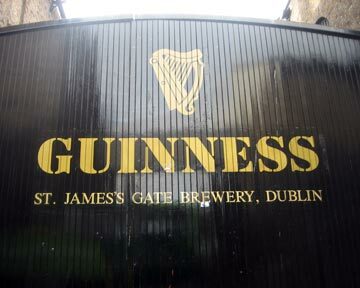 Did you know that Guinness Stout is same Guinness that compiles The Guinness Book of World Records?!? I never realized that! By far the best part of the museum, however, is the Gravity Bar on the top floor. Here your admission ticket can be exchanged for a complimentary pint, which is enjoyed while taking advantage of 360° views of the city of Dublin. We woke up early on Saturday to visit Trinity College and see the Book of Kells. The tours are led by Trinity College students so Trish, Laurie Ann and I were a little more enthused to learn about the history of the university when our tour guide ended up being a handsome Irish lad that was our age! Handsome tour guide aside, it was a very interesting tour and by the end, it was pouring rain so we were glad it was time to go inside and see the Long Room Library and the exhibit about the Book of Kells. For a book-worm like myself, the two-story tall, wood-paneled library was awesome. The books are not arranged in any traditional way, like Dewey Decimal system, but instead are organized by height and width. Imagine trying to find the one book you need!? We then went to Christ Church Cathedral and St. Patrick’s Cathedral. We ended up that afternoon on Grafton Street, the shopping street in Dublin. Despite being tempted by earrings and bracelets in Accessorize and many cute tops in Vero Moda, I didn’t buy a thing (so unlike me). 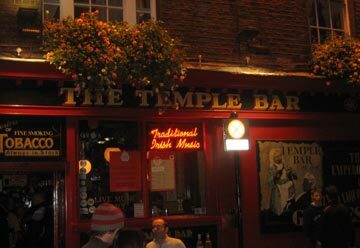 And to wrap up a fantastic day, that night we went to the world-famous Temple Bar. We were lucky enough to catch some live Irish music while enjoying a pint of Guinness, it was everything I could have hoped for while in Ireland. Sunday we only had a half-day (since we had flights to catch) but we went to the National Gallery, an awesome place for students since admission is free. I’m so glad I made it to Ireland and I hope I’m able to return in the spring to visit other parts of the country. Most likely I will go to Cork, where I will have a number of good friends studying during the second semester. I was exhausted by the time I was back in Leuven. But, I couldn’t believe it only took three hours, once I boarded my flight in Dublin until I was back in my bedroom in Belgium. As for everyone back on the Main Line, the Phillies have made the World Series. Lets go Phillies!! Next weekend I am headed to Aachen and Monschau, Germany. Look for my next entry on my new home away from home, celebrating the beautiful city of Leuven.